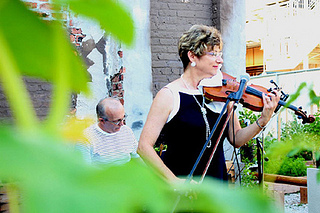 NNA is hosting an evening of "Music in the Garden," featuring returning artists Dan Strba and Monica Sterling. Please bring your own chair, as you will sit in the aisle among the garden plots. The ground is gravel and metal, not suitable for blanket seating for picnicking. Dan Strba, violist, of the Houston Symphony and his wife, Monica Sterling, violinist and vocalist, of The Best Little Klezmer Band in Texas have generously offered to play at Montrose Green again! Both are well-rounded musicians, and their illustrious careers include working with: The Chicago Symphony, the Frank Sinatra Orchestra, Sammie Davis Jr, Tony Bennett, Peggy Lee, The Moody Blues, The Galilee Symphony Orchestra in Israel, and the U.S. Army Chamber Orchestra for White House State functions.